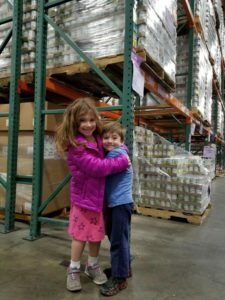 Zoe and Zac Poiley, age 6 and 4, donate 100% of their profits to the Los Angeles Regional Food Bank. What’s better than a warm cup of cocoa on a cold winter day? Realizing that 100% of the proceeds will go to members of our community who need help. 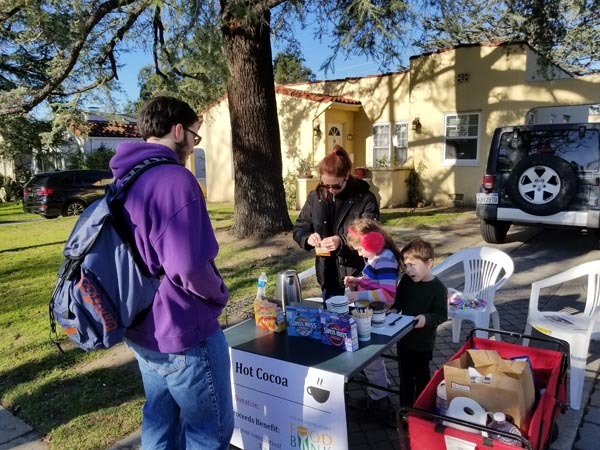 Last month, in the spirit of giving during the holiday season, Zoe and Zac Poiley, ages 6 and 4, of Glendale decided to raise funds for those in need of food assistance in Los Angeles County. Their efforts provided more than 400 meals to children, seniors, working families and individuals facing hunger in our community. It wasn’t long before neighbors were lined up to support Zoe, Zac and the Los Angeles community. After a successful weekend of sales, Zoe and Zac brought their donation to the Food Bank. Chief Development Officer Roger Castle provided the family with a tour of the facility to see the impact of their philanthropic venture. Zoe and Zac learned that for each dollar donated the Food Bank provides four meals to the community, so their efforts provided more than 400 meals to our neighbors in need. They saw rows of food stacked to the ceiling and were surprised to hear that 1,000,000 pounds of food move through the Food Bank warehouses each week. Winter nights, even in California, can be uncomfortably cold. A warm home is important for staying healthy during the cold and flu season, but many of our neighbors can’t afford to heat their homes and also purchase groceries, so they have to make a choice: heat or eat?. Fortunately, thanks to donations like the one made by Zoe and Zac, there is a third option. Our neighbors in need can get food assistance one of our 600+ partner agencies and keep their home at a healthy temperature. It’s amazing to realize the many ways in which cocoa can make the winter just a bit warmer. If you would like a tour of the Food Bank, contact Amy Hasquet, Director of Annual Giving, at (323) 234 – 3030 x 140 or via email at [email protected].